This week is busy day in our office. Tons of activities must be done. Every moments immortalized by camera. In the end of activity, one of the staffs here doing a “smart” thing. Playing around with the camera, and deleted all photos that I’ve took! I have no idea why he did that. I guest he wanted to see the photos, but “delete” button he pressed. All the photos were deleted! Honestly I’m little bit despiteful with him. But nothings matter, I’ve found the solution how to recover all the photos!. I tried to Google, but I’ve found all the recover softwares are shareware. And need cost to use it. I didn’t give up. Finally I’ve found an amazing software that can used by free! It called PC INSPECTOR Smart Recovery. 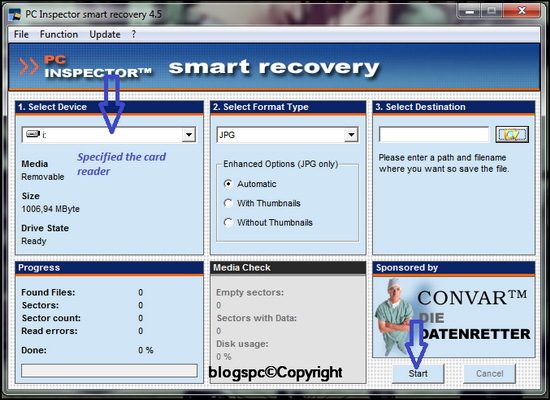 PC Inspector Smart Recovery is a data recovery program for Flash Card, Smart Media, SONY Memory Stick, IBM Micro Drive, Multimedia Card, Secure Digital Card(SD) or any other data device for digital cameras. It enables you to recover accidentally deleted or formatted pictures, videos or sound files from the selected media. The program also offers a mode that enables you to check the media for errors. This CONVAR DEUTSCHLAND GmbH product can run smoothly in all windows platform. It’s handy program and really easy to use. Plug in your memory card to your laptop or PC. It can be directly or via data cable connection. The important thing is have a new drive letter appear in order to recover your delete photos. In this moment I connect via data cable. Open/run PC Inspector Smart Recovery . Specify memory card drive as picture above. In “Select Format Type’, leave it the format as JPG. Browse where you want to save recovered photo. Wait for couple minutes. Its depends on how much your memory card size and photos. Simple steps right? After this you will get all your deleted photos. Kay Exa has written 3 post in this blog.